Water is using Smore newsletters to spread the word online. An Argrendage is a simple tool! It's pressurized Argon gas inside of a canister with a quick-release mechanism. 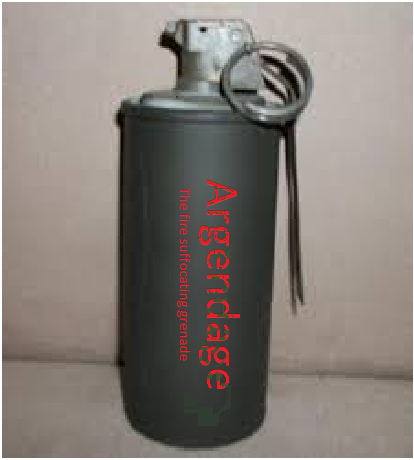 Users need only to pull the pin and release the canister in an area with fire, and the Argon gas will quickly spread, preventing the spread of the flames. The fire will be unable to sustain itself due to the fire-resistant properties of Argon (Argon pushes out oxygen, and cannot ignite). Pyro-b-Gone is a clever mixture of pyrogallol and calcium bicarbonate. When these two substances mix, they produce a chemical reaction that removes oxygen from the immediate area. By storing pyrogallol and calcium bicarbonate separately inside of a unit resembling a fire-extinguisher, we have enabled an easy, rapid response option for homeowners in case of fires. By employing the Argendage and Pyro-b-Gone system, we can save up to 1000 gallons of water per house fire. Additionally, Pyro-b-Gone can often be more effective than the standard fire-extinguisher, as it can perform its function faster. As a result of this water saving process - along with potentially reduced repair costs - the community saves a large amount of money. In the long run, this system would be highly cost-efficient, but it should be noted that initial production costs could be quite due to the relative rarity of Pyrogallol (Argon cost roughly 50 cents for 100 grams, while Pyrogallol costs up to $1.00 per gram). Argon is present in the atmosphere, and causes no harm whatsoever to the environment. The mixture of Pyrogallol and Calcium Bicarbonate is biodegradable after a short time. To implement this idea, we would only need a packaging location and a method of acquiring the materials.